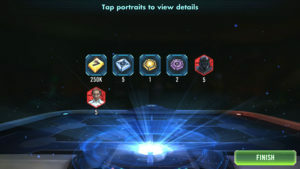 The latest money-grab from Star Wars Galaxy of Heroes by EA and Capital Games is called the Citadel Pack. Featuring a chance to get shards of Rogue One Characters Director Krennic and the Death Trooper this “Limited Time Offer” features ability materials, credits and more. “Each pack guarantees 5 shards each for Director Krennic and Death Trooper with a chance to get 30 shards!” All for just 2,999 purple crystals. So let’s break this down. I just paid $19.99 in real US Dollars (plus tax) for 2,800 crystals to test this one out and then spent 2,999 crystals on the Citadel Pack. I did so after reading that the payouts are crap. What did I find? The payouts are crap. 5 shards of Krennic, 5 shards of the Death Trooper, an Omega material, 250k credits and not much more. Wow. Crap. “I usually try to be as constructive as possible with my criticism, but I don’t know what to say. I was looking forward to playing with something new, and saved up over a vault worth of crystals from arena winnings on the chance the packs would be reasonable. This is not reasonable. Final Thoughts: EA and Capital Games, who are tied together in this game and both deserve criticism, continue to screw their customers over. From the nerved Barriss Offee Zeta & cheating in the Jyn Erso tournament (and other tourneys) to the crazy prices they are charging now, this game is not getting better. If you want to make more in the short term and ruin your long-term viability as a company, EA and Capital Games are on the right path (toward the Dark Side). If you buy the Citadel Pack you are a fool – just like me.